Updating with my thumbs from the picket line: the Provost's CORRECT email is feser@illinois.edu. Day 1 of NTFC Local 6546's second strike. To recap: 10+ hours of mediation on Wednesday ended with the administration presenting a slight variation on the same set of unacceptable proposals they've been presenting all along and then walking out. NTFC voted to strike the next day. So there we were, once again, today, walking in circles, handing out fliers, shouting. A picket line is all about the noise and movement, yet once inside that noise and movement, it is easy to fall into a meditative state, at the edges of which you hear people explaining or trying to understand what the noise and movement is all about. "Multiyear contracts" come up a lot, as do "performance evaluations," "shared governance," "respect." Lots and lots of words get expended to make it clear that it's not about the money. These are all accurate representations, all of them important. None capture, though, what motivates faculty to leave the classroom and spend hours at a time on the pavement, walking, walking, walking, shouting, walking, shouting, contemplating. We would all rather be teaching. Multiyear contracts? That sounds like something one could reasonably object to, particularly in a cash-strapped state like ours--but then we point out that the "multiyear contracts" in question are not anything tenure-like, just a commitment that after five single-year contracts, faculty get a two-year contract. After ten years of continuous employment, they get a three-year contract. Automatically? No, not automatically--we want annual performance reviews, too. No, we don't get those already--not everyone, anyway. Those, too, are something we're trying to get into our contract that the administration is resisting. Shared governance? We want departments to have to come up with policies for including us in it--we're not actually binding anyone to specific contractual provisions. It all starts to sound rather pathetic. Except that the administration is peculiarly dug in on not agreeing to any of it. Which is exactly why it's all so important. What NTTs have in the absence of a union contract is a system of coercion, where the institution leverages their love of their subject matter and commitment to their students or research to get them to do the work of tenure-stream faculty without tenure, tenure-stream working conditions, or tenure-stream remuneration. This, apparently, is what excellence looks like. Without a union contract, NTTs have no countervailing leverage. They can do the work they love or they can leave. It's not a choice structure that naturally lends itself to excellence, so NTTs who chafe within it alternately find themselves scorned because they ask so little or scorned because they've had the presumption to ask for more. Therefore: NTTs rightly ignore meaningless policy documents. They look instead to a union with the power to collectively bargain a contract bearing the "moral ideal of equal respect for all." We're walking and shouting because a union is only as good as the contract that it can bargain. A contract that codifies the system of coercion is no contract at all. 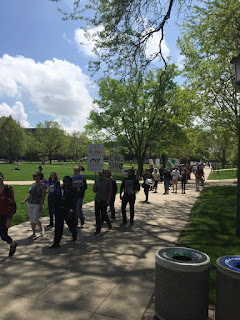 If you're here at UIUC, come join us Friday (4/29) on the picket line at the English Building, 608 S. Wright St. We'll be there from 8am to 5pm. Come for a little or come for a lot. If you haven't picketed before, you'll feel weird doing it, but that's okay--everyone does. Once you get past the initial discomfort with chanting in unison, having an excuse to yell a lot can feel downright cathartic. Also, whether you're here or not, let the administration know your thoughts. Call or email Interim Provost Ed Feser: 217-333-6677; efeser@illinois.edu. Call or email Acting Chancellor Barb Wilson: 2​17­-333­-6290; bjwilson@illinois.edu. Ask them to bring this labor action to an end by urging the administration bargaining team to agree to a fair contract. The one that the University of Illinois has already ratified for NTT faculty at the University of Illinois at Chicago will do nicely.